The Andy T Band, fronted by guitarist Andy Talamantez, began in 2011 as the Andy T – Nick Nixon Band, with vocalist Nick Nixon. 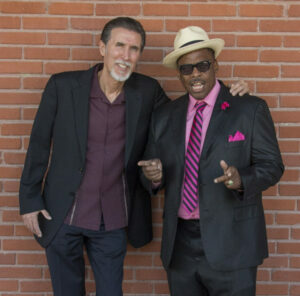 As Blues Underground Network said, “Simply put, Andy T and Nick Nixon have quickly risen to the top of many people’s lists of Great Collaborations.” Their release on Blind Pig Records, Numbers Man, was nominated for a 2016 Blues Music Award as “Best Traditional Blues Album”, and the band was nominated for “Band of the Year” by The Blues Foundation. Now, Anson Funderburgh has joined the band! This Blues Music Awards nominated guitarist has led his band Anson Funderburgh and the Rockets since 1978. The Rockets have been repeatedly acclaimed as one of the best live blues bands in existence. The band has won ten W.C. Handy awards, including three “Band of the Year” awards and the 2004 award for “Best Traditional Album”. Anson himself has played with Delbert McClinton, Boz Scaggs, Snooks Eaglin, Grady Gaines, Earl King and Jimmy Buffett. Live, the Andy T Band has been extremely well received, highlights including the 2016 King Biscuit Festival and the Jan 2017 Legendary Rhythm and Blues Cruise. The band, featuring Alabama Mike, has recently completed a new album, Double Strike, again produced by Anson Funderburgh.